Sondra Williams drives in a jeep with Vietnamese woman. Visits cadre in home improvement in Chi Long, talks of teaching sewing and cooking and home improvement. Shots of Sondra greeting young women in village. Talks of difference in cultures and what seems like poverty in the US, is a traditional way of life (such as eating bowls of rice). Shots of smiling village children, Sondra walking through village to the homes of the students in the home improvement class to give them encouragement. Family shows their new well, walks through field. Williams talks about many coming from the North and talking about the old days, but has never heard criticism of where they live now, or that they want to go back eve though they probably do. Shots of villagers talking with Williams. 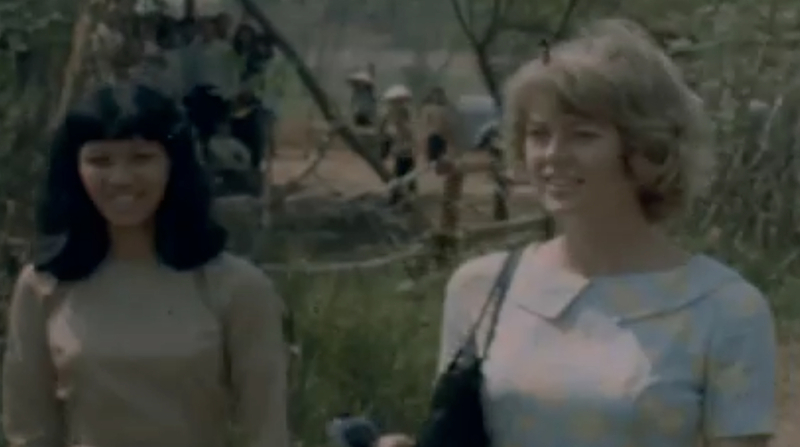 Chicago: “Vietnam: A Television History; Sondra Williams - Education - Chi Long - South Vietnam,” WGBH Media Library & Archives, accessed April 22, 2019, http://openvault.wgbh.org/catalog/V_4E77E1C3A0EA4DE5879E578A0DEC22DC. MLA: “Vietnam: A Television History; Sondra Williams - Education - Chi Long - South Vietnam.” WGBH Media Library & Archives. Web. April 22, 2019. <http://openvault.wgbh.org/catalog/V_4E77E1C3A0EA4DE5879E578A0DEC22DC>.